Therm-a-Rest Tranquility 6 Tent. This 100% freestanding 6-person tent was built for convenience and livability, and its generous size, strength and creature comforts make the it the ultimate in camping luxury. Therm-a-rest drew from their 45 years of camping experience to create the Tranquility tents, and added crucial touch-points such as integrated vestibules, an easy-to-manage rainfly, and set-up that’s so simple, just one person can handle it. This is the customized car-camping tent you’ve always wanted but were never able to find ... until now. Includes backpack stuff sack for easy transportation. 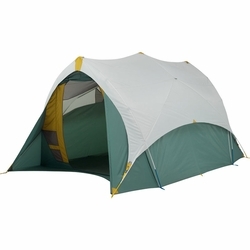 Easy Set-Up: The vestibules are completely integrated with the tent body and don’t require the rainfly. Thoughtful touchpoints such as the 5-hub pole structure makes set-up quick and easy. Easy Entry: The vestibules provide easy transition in and out of the tent, plus there are integrated mud mats, pocket organization and utility loops for hanging wet clothing outside the tent and out of the weather. Independent Rainfly: The tent is completely freestanding with and without the rainfly, allowing you to move the tent without hassle. Managing the rainfly is easy, making it simple to switch from stargazing-mode to full-coverage if it starts to drizzle. Peak Ventilation: Independent rainfly provides peak and side wall venting for maximum sunny and bad weather ventilation. Freestanding Arch: Provides rainfly with a pitched roof that sheds even the worst weather.